Married Mariely … has two children: Kevin and Mahia ... Twitter: @ KelvinHerrera40 … Instagram: @theboyk ... Attended Regino Camilo High School in the Dominican Republic. Combined to go 2-3 with a 2.44 ERA (12 ER/44.1 IP), 17 saves and 38 strikeouts over 48 relief appearances in 2018 with Kansas City and Washington ... Converted 17 of 19 saves, including all three with the Nationals … recorded a 1.98 ERA (8 ER/36.1 IP) with 14 saves over 38 games in the first half, but was limited by injuries to 10 games after the All-Star Break ... Began the season with a streak of 11 consecutive scoreless appearances (9.2 IP) in March/April … did not allow his first run until 5/1 at Boston ... Also made nine straight scoreless outings from 5/18-6/9 (9.0 IP), converting 6-6 save opportunities during that span ... Was traded to the Nationals as part of a four-player deal on 6/18 after posting a 1.05 ERA (3 ER/25.2 IP) with 14 saves over 27 games with the Royals ... His ERA was at 0.98 (3 ER/27.2 IP) after throwing 1.0 scoreless IP on 6/21 vs. Baltimore ... Was placed on the 10-day disabled list on 8/27 with a Lisfranc fracture in his left foot and missed the rest of the season. Recorded a career-high 26 saves in 31 opportunities ... Made just 64 appearances and recorded 59.1 innings, both his fewest since 2013 (59 appearances, 58.1 IP) ... Earned three wins, recording scoreless ninth innings ahead of walk-off wins on April 16 vs. the Angels, July 16 vs. Texas and July 23 vs. the White Sox ... The Royals scored a total of six runs in his 59.1 innings on the mound, a 0.91 run support average, third lowest among Major League relievers ... Blew his first save opportunity of the season on April 9 at Houston, allowing a game-tying solo home run in the ninth inning to Jake Marisnick ... Converted 26 of his next 28 save opportunities (92.9%) from April 13-Aug. 16, the best percentage in the American League during that four-month stretch ... Three weeks passed before his next save opportunity on Sept. 7 vs. Minnesota, when he allowed three runs on three hits and two walks, turning in a 2-1 ninth-inning lead into a 4-2 loss ... Removed from one-run game with two outs in the ninth inning on Aug. 22 vs. Colorado with right forearm tightness ... Allowed nine runs (seven earned) in 4.2 innings (13.50 ERA) during a six-appearance stretch from Sept. 1-20, including two unearned runs on Sept. 1, when he exited with a right forearm strain ... Removed from closer's role on Sept. 8…finished the season with 5.0 scoreless innings over his last five appearances, and retired 17 of the last 19 battes he faced ... Allowed seven home runs through 24.1 innings (2.59 HR/9) over his first 25 appearances, but allowed just two HR in 35.0 innings (0.51 HR/9) over his last 39 outings ... Had a 3.27 ERA (12 ER in 33.0 IP) in 35 save situations and a 5.47 ERA (16 ER in 26.1 IP) in 29 non-save situations. • Had a 1.78 ERA (5 ER in 25.1 IP) in 27 road appearances, the eighth-best road ERA in the AL (min. 25.0 IP) ... Ranked second in the Majors with nine saves in May, trailing only Alex Colome (10) ... Saved all three games of a sweep vs. Baltimore from May 12-14, becoming the sixth Royal (12th time) to save all three games of a series and the first since Joakim Soria from July 3-5, 2010 at Seattle ... Recorded a two-out, two-pitch save on June 18 at the Angels…inherited a two-on, one-out jam in the ninth before inducing a game-ending double play by Albert Pujols on his second pitch, becoming just the third Royal (fourth time) to record a two-out save on two pitches or fewer, joining Jeremy Affeldt (May 26, 2004) and Jeff Montgomery (Aug. 9, 1992 and Sept. 28, 1990). Made a team-high 72 appearances, posting a 2.75 ERA (22 ER in 72.0 IP) and .214 opponents' average with career highs in saves (12) and strikeouts (86)...Ranked second among AL relievers in strikeout-towalk ratio (7.17), tied for fourth in appearances and 11th in WHIP (0.96)...His 1.50 walks-per-9.0 innings (12 BB in 72.0 IP) was the lowest by a Royal (min. 70.0 IP) since Paul Byrd (1.50) in 2002...Started the season with 14.1 consecutive scoreless innings over 15 outings before allowing a run on May 10 at Yankee Stadium...Recorded his first of 12 saves on July 9 vs. Seattle, his first since April 10, 2013 vs. Minnesota...Of his 12 saves, 10 came in August, one shy of the Major League lead...Recorded a save in five straight outings from Aug. 21-29, the last of which (vs. the Yankees) was his first career four-out save...Posted a 1.63 ERA (9 ER in 49.2 IP) in 50 outings through Aug. 6…had a 5.24 ERA (13 ER in 22.1 IP) in his last 22 outings, including three where he allowed three-or-more runs...Yielded four runs in a loss on Sept. 16 vs. the White Sox, marking the third time in 351 career appearances that he's allowed four runs or more...Recorded a career-high 26 holds, tied for fourth most in the AL in 2016 and tied with Jason Grimsley in 2001 for third most in Royals history. Named an American League All-Star for the first time in his career...he didn't pitch in the game...Made 72 appearances out of the bullpen in his fourth-full season in the Major Leagues, going 4-3 with a 2.71 ERA (21 ER in 69.2 IP), striking out 64...Allowed just five home runs on the year…snapped a streak of 105.1 innings without allowing a home run on May 5, when he gave up a solo shot to Cleveland's Lonnie Chisenhall at Kauffman Stadium...streak is the second-longest by a reliever in club history, behind Wade Davis' 125.2 innings...Went 3-0 with a 1.29 ERA in 35 appearances at 'The K'...he was 1-3 with a 4.50 ERA on the road...Made 11 Interleague appearances, going 1-0 with a 1.54 ERA, while holding National League hitters to a .171 average...Didn't allow a baserunner in 28 of his outings…he struck out the side in 1.0-inning relief stints against Cleveland on June 2 and in Detroit on August 6...His .151 (18-for-119) opponents' batting average against lefties ranked sixth in the Majors, among pitchers with at least 100 at bats by left handers...Appeared in 11 games, going 1-0 with a 0.66 ERA (1 ER in 13.2 IP), allowing three walks and recording 22 strikeouts...His strikeout total was second-highest by a relief pitcher in postseason history, trailing only the Angels' Francisco Rodriguez, who fanned 28 in 2002...Did not allow an earned run over his final eight appearances, spanning 10.2 innings in the ALCS and World Series...Tossed a postseason career-high 3.0 scoreless innings in Game 5 of the World Series, allowing just one hit. Kelvin was outstanding in his third full season in the Major Leagues, ranking fifth among MLB relievers in ERA (1.41)...Recorded a 31.0 inning scoreless streak from June 27 to September 16...The stretch was the second-longest in club history, trailing only Wade Davis' 31.2 innings, which he did simultaneously this year...Herrera's scoreless streak was also the second-longest in the American League this season...Posted an 0.48 ERA (2 ER in 37.1 IP) from June 27 to the end of the season, lowest among MLB relievers (minimum 30.0 innings)...Held opponents to an 0.79 ERA on the road (3 ER in 34.1 IP)...It was second-best all-time among Royals pitchers with at least 30.0 innings on the road, trailing only Wade Davis' 0.75 mark...Did not allow a home run, extending his stretch to 95.0 innings, the longest span in club history by a reliever...The last home run he allowed came to White Sox 3B Conor Gillaspie on July 26, 2013...Stranded 25 of his 27 inherited runners from May 28 on after allowing six of his first 11 to score...Made 11 appearances in the postseason, going 1-0 with a 1.80 ERA (3 ER in 15.0 IP)...Earned his first postseason victory in Game 2 of the World Series, pitching 1.2 scoreless innings...Tied a Royals postseason record with four strikeouts out of the bullpen in Game 7 of the World Series...After allowing a run in the Wild Card Game vs. Oakland, he made eight-straight scoreless relief appearances before surrendering two runs in Game 5 of the World Series...Pitched in all four games of the ALCS vs. Baltimore, allowing no runs on two hits with one walk and six strikeouts in 5.2 innings. Kelvin had an up-and-down year that began in a set-up role and included stints in the minors. Optioned to Omaha (AAA) twice before the All-Star Break, but pitched the entire second half in the Majors...posted a 2-2 mark and a 2.64 ERA (9 ER in 30.2 IP) over 30 appearances after the break. Averaged 11.42 strikeouts per 9.0 IP, which ranked ninth among A.L. pitchers with 50.0 innings or more ... his total was sixth-best in KC history. Kelvin established himself as a reliable set-up man in his rookie season, tying for the club lead with 19 holds...allowed just 4 home runs in 84.1 innings and none in his final 69 outings, covering 76.0 innings...Herrera's 2.35 ERA was the best among all A.L. hurlers with at least 80.0 innings pitched and the fourth-best in baseball...went 4-2 with 3 saves and posted a 1.52 ERA from July 5 (7 ER in 41.1 IP) to end of season...Kelvin's 76 appearances were the most in season by a Royals rookie, topping the old mark of 68, which was shared by Tim Collins (2011) and Mike MacDougal (2003)...tied for second in the A.L. in appearances...Saw consistent success at home and on the road, recording a 2.38 ERA and allowing an opponent OPS of .643 at home and a 2.31 ERA and allowing an opponent OPS .642 on the road. Kelvin pitched at four different levels in the Royals system, ending the year with two appearances for Kansas City. ... Made his big league debut on September 21 vs. Detroit, allowing 3 runs in an inning to take the loss ... bounced back on September 26 to toss a scoreless frame at Minnesota. ... Named the Royals organization's Paul Splittorff Pitcher of the Year ... struck out 70 in 67.2 minor league innings ... also pitched for the World team in the XM Futures All-Star Game on July 10 at Chase Field in Arizona. ... Combined with starter Will Smith (7.0 IP) to toss a no-hitter for NW Arkansas on July 19 at Arkansas ... Herrera tossed the final 2.0 innings to complete the first no-hitter in Naturals history. Missed a majority of the season with a stress fracture in his right elbow. January 8, 2019 Chicago White Sox signed free agent RHP Kelvin Herrera. 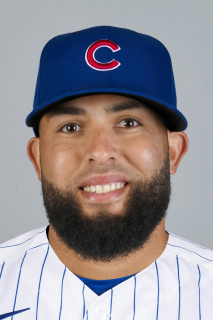 October 29, 2018 RHP Kelvin Herrera elected free agency. October 1, 2018 Washington Nationals activated RHP Kelvin Herrera from the 10-day disabled list. August 27, 2018 Washington Nationals placed RHP Kelvin Herrera on the 10-day disabled list. Left Lisfranc tear. August 21, 2018 Washington Nationals activated RHP Kelvin Herrera from the 10-day disabled list. August 8, 2018 Washington Nationals placed RHP Kelvin Herrera on the 10-day disabled list. Right rotator cuff impingement. June 19, 2018 Washington Nationals activated RHP Kelvin Herrera. June 18, 2018 Kansas City Royals traded RHP Kelvin Herrera to Washington Nationals for 3B Kelvin Gutierrez, CF Blake Perkins and RHP Yohanse Morel. May 13, 2015 Kansas City Royals activated RHP Kelvin Herrera. May 7, 2015 RHP Kelvin Herrera roster status changed by Kansas City Royals. July 19, 2013 Kansas City Royals recalled RHP Kelvin Herrera from Northwest Arkansas Naturals. July 15, 2013 Kelvin Herrera assigned to Northwest Arkansas Naturals from Omaha Storm Chasers. June 25, 2013 Kansas City Royals optioned Kelvin Herrera to Omaha Storm Chasers. June 4, 2013 Kansas City Royals recalled Kelvin Herrera from Omaha Storm Chasers. May 23, 2013 Kansas City Royals optioned Kelvin Herrera to Omaha Storm Chasers. October 14, 2011 RHP Kelvin Herrera assigned to Leones del Escogido. September 21, 2011 Kansas City Royals selected the contract of Kelvin Herrera from Omaha Storm Chasers. July 27, 2011 Kelvin Herrera assigned to Omaha Storm Chasers from Northwest Arkansas Naturals. July 11, 2011 Kelvin Herrera roster status changed by Northwest Arkansas Naturals. July 9, 2011 Northwest Arkansas Naturals placed RHP Kelvin Herrera on the temporarily inactive list. May 9, 2011 RHP Kelvin Herrera assigned to Northwest Arkansas Naturals from Wilmington Blue Rocks. April 5, 2011 Kelvin Herrera assigned to Wilmington Blue Rocks from Kane County Cougars. May 19, 2010 Kelvin Herrera roster status changed by Burlington Bees. September 8, 2009 Burlington Bees activated RHP Kelvin Herrera from the 7-day disabled list. May 17, 2009 Burlington Bees placed RHP Kelvin Herrera on the 7-day disabled list retroactive to May 7, 2009. May 4, 2009 RHP Kelvin Herrera assigned to Burlington Bees from Idaho Falls Chukars.